If the regression ‘error’ is reduced by the taking into account the cross-regression part (i.e., in order to predict the future of X, to use not only the past of X, but also the past of Y) significantly, then Y is defined to ‘Granger-cause’ X. ‘Significantly’ of course means that (intransparent) statistical tests are involved. The tests tell you if a connection is g-causal or not, finally leading to a binary result (causal connectivity matrix). This is most likely due to historical reasons. In econometrics, a time series is causal to another one or not. The main author of the scholarpedia article, Anil Seth, also provides a GNU-licenced Matlab package (link to homepage [Update 06-2015: new, modified version, which I tested under Linux]) which turns out to be working nicely out of the box (Matlab 2009b, Windows 7). I couldn’t compile the mex-file, but this file is not necessary for basic testing. [Update: problem solved, took me 4 hours :/] The package is very well documented and easy to understand; it is furthermore accompanied by a very instructive demo. – I applied the basic functions on my dummy C. elegans data in order to be able to compare the methods more easily. Interaction matrix computed with Granger causality. 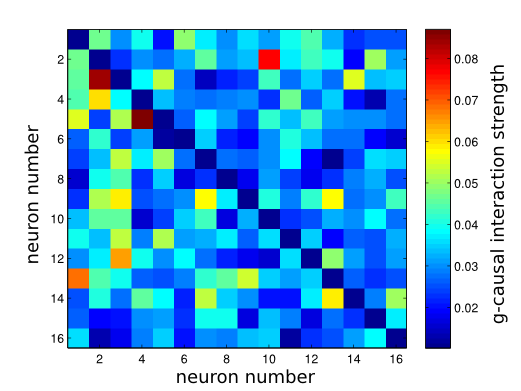 Connectivity diagram, with the numbers indication the neurons. Left: Highly significant connections. Right: Lower significance level. To sum it up, G-causality is an interesting method which I would like to re-visit later. The outcome is not an improvement of the correlation matrix, but something different. The Matlab package by Anil Seth is easy to understand and useful. As a drawback, the method of linear regression is intransparent, because you only find out if e.g. timeseries Y can help to predict timeseries X, but there’s is no measure about the nature of this influence. When you look into the details, there is a lot of stuff which must be improved, but most of this is already covered e.g. by this Matlab package. In order to be able to apply it succesfully to a data set, one has to dive deeper into things than I have done today.